The theory of managing expectations and conversations » Acts, not ads. Doing too much good can actually be bad. Trying too hard to get a lady will only make you fail, trying too hard to close a deal will definately make you fail and over-the-top-delivery of expectations will make you fail. Don’t try too hard. Driving conversations is very much about managing expectations. The time you were pleasantly surprised by a company’s remarkable culture, great customer service, the time a company left you a personal note or a personal business card. Or the time a company #fail-ed you. I was inspired by a blogpost by Guillaume van der Stighelen, one of the founding fathers of the Belgian advertising industry (and one of the most charming gentlemen you will ever meet) about the simple basics behind managing expectations. 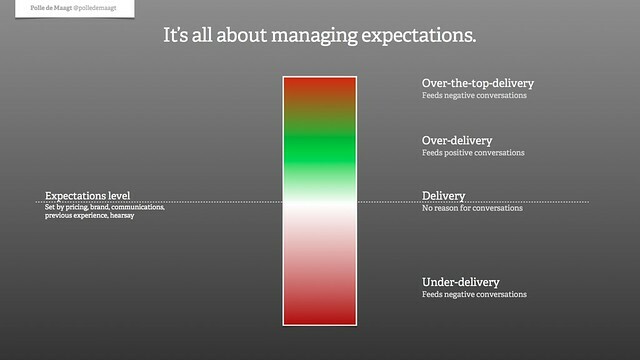 So, here’s a simple visualization of the managing expectations spectrum. Download it, use it, remix it, mock it, spread it or share it. Do what you like. The most interesting category, however, is the over-the-top-delivery. I once heard a guy tell a story about a company that produced hipster bags. Every time you would order via their website, they would send you an email claiming that your bag had just left their factory and that 10 employees stood there, waving the bag goodbye. A great story and it was made even more appealing by some great copy. But it had the opposite effect, the guy had a negative feeling about it all. It was just too good to be true. They were just trying too hard. Another problem is the content of over-delivering. Getting a free drink at the end of your dinner is a nice gesture of the restaurant. Getting a 50% discount might make you feel cheap and make you talk about the discount and not about great service or great food. Ideally, you’re over-delivering in a way that spurs the right conversations. Some even think Boondoggle’s KLM Surprise case is an example of over-the-top-delivery. KLM might have tried too hard to surprise customers. I do not agree, I still think it is a great campaign, but it raises an interesting dilemma: balancing over-delivery. The art of managing expectations: over-delivering to create the right conversations.